Georgetown is one of the oldest and perhaps best known neighborhoods in Washington, DC, located in the northwest quadrant. Home to Georgetown University as well as the embassies of France, Mongolia, Sweden, Thailand, among others, Georgetown is a picturesque collection of 18th century row houses set on tree-lined cobblestone streets. Prospective residents can also choose from a variety of new luxury condominium developments where a number of Washington’s elite make their homes including 3303 Water, the Residences at Harbourside, and Washington Harbour, among others. 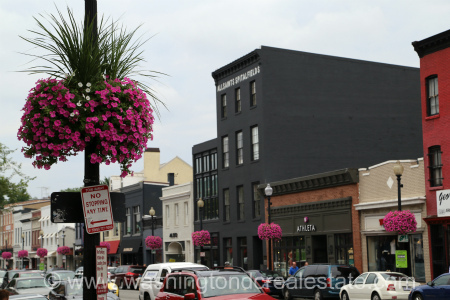 Read more about Georgetown real estate. Georgetown’s pretty exterior along the Potomac River belies its mix of high-end shopping outlets, nightclubs and destination dining experiences. The vibrant Georgetown nightlife is well-known as a tourist attraction to visitors and residents alike. Georgetown is bounded by the Potomac River to the north, Georgetown University, Montrose Park and Rock Creek Parkway. The main thoroughfares are M Street and Wisconsin Avenue. The Georgetown neighborhood is not served directly by a Metro Station with the nearest stations all located approximately one mile away, including Foggy Bottom, Dupont Circle, and Rosslyn.